Original Tall Boot Socks is rated 4.3 out of 5 by 311. Add a personal touch to your Hunter Boots with these warm and snug boot socks. 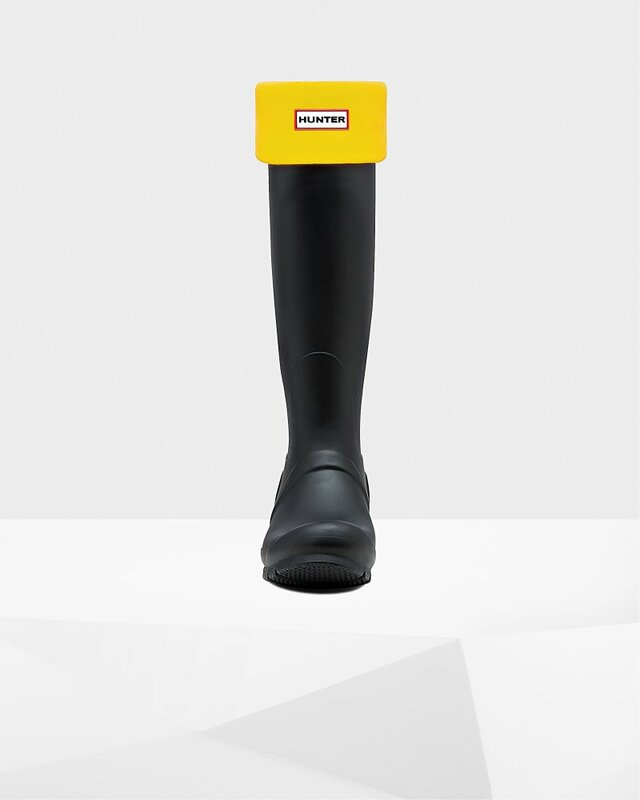 Designed to fit comfortably inside the Original Tall Rain Boot and enhance fit while adding comfort and warmth, these boot socks feature a black fleece leg and contrasting yellow fold down cuff finished with the Hunter Original logo. Rated 1 out of 5 by MotaMac from They do not work The tops of the socks slides back inside the boot when I walk. Rated 5 out of 5 by Kathy from I want them ALL! My husband gave me Hunter tall boots - in black - for Christmas. I proceeded to buy a variety of colored tall boot socks (to match my outfits). What fun! They are soft and warm and receive so many compliments. I would love to have a pair in every color. The only slight downside - is they are bit pricey. Rated 1 out of 5 by RainyinDallas from Huge I just got them today and I thought they had sent me the wrong size by accident. I wear an women’s US 8 in the boots and ordered the large. They are too big and bunch up in the shoe. Not sure what to do. Rated 3 out of 5 by ahardesty13 from Upset with this purchase I have these exact socks in black and love them. I'm a huge fan of Hunter products. I bought the same size socks in white and they were just way too big. They didn't fit around the top of my boots they were so baggy. I really wanted these in white but I just sent them back. Not sure why they didn't fit the same as my black ones in the same size. Rated 5 out of 5 by Lori from Really warm I like the boot socks. They are for really cold days.